Coming across the Cory Spedding story on Steve Brookstein’s blog reminded us to check out the book that Steve put out towards the end of last year, Getting Over The X. Some background for readers who need it: Steve Brookstein was the first winner of the UK X Factor, in 2004. After getting six million votes in the final, his post-show trajectory quickly went awry: he was disappointed at being made to do an album of covers, having hoped to include some of his own original material; and he suffered the indignity of seeing the runners-up, popera quartet G4, have their album launched before his. Within eight months, he had decided to part company with his label. Since then, Steve has become something of a tabloid punchbag, with occasional stories gleefully poking fun when one of his gigs can be made to seem disappointingly low-rent: a “pizza restaurant”, a “ferry”, a “village pub”. (Steve makes the case in his book that these descriptions are unfair, and that the tabloids ignore his other more prestigious gigs). The show has effectively airbrushed him from its history. While nothing in Getting Over The X will be too surprising for readers who already view the show from a Sofabet perspective (new readers might like to check out our How To Watch The X Factor post), here are our five main takeaways. We generally work on the assumption that supposed judge-judge or judge-act animosities are all part of the pantomime, confected to motivate votes in a certain way or simply to keep the show in the headlines. Steve’s book is a reminder that sometimes the smoke comes from fire rather than a smoke machine: it seems that Sharon Osborne and Louis Walsh genuinely did dislike him. 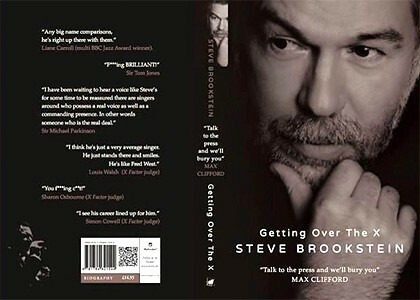 Steve recounts his view that his post-show troubles stemmed from a meeting with Cowell’s then-media man, Max Clifford, at which Clifford demanded to know any story about Brookstein that the papers could conceivably get hold of. This, Clifford explained, would enable him to exert influence over whether and how those stories appeared. Brookstein describes how Clifford played the media management game: when an unfavourable story threatened to appear, he would trade another secret with the journalist in return for keeping the first story quiet. At this meeting Steve says he opted not to mention a past experience of sexual experimentation, which he later alluded to in an interview with Closer magazine. As Brookstein tells it, this annoyed Clifford and Cowell so much that they ultimately resolved to ensure he never got any more positive media coverage. Clifford himself is now in prison, but Brookstein says he is still ostracised by media outlets who are keen to keep in the show’s good books – he explained to the William Hill podcast last year that The Sun bought exclusive rights to the story when he published his book, and then chose not to run it. From an X Factor betting perspective, this reinforces another of our working assumptions: that any show-related story which appears in the tabloids will do so with the show’s blessing of how it portrays an act, either because they planted it or because they didn’t care enough to squash it. Interestingly, in that podcast interview, Steve recommended paying especially close attention to the choice of photos in The Sun – which acts are pictured in glamorous surroundings, and which are pictured munching a sausage roll outside Greggs. Not thinking any more of it, Cassie simply repeated the line to camera. As regular readers will know, this is the kind of thing we have long assumed goes on as part of producers’ efforts to influence the public vote – see e.g. our retrospectives on 2013’s Abi Alton (“bum notes”) and 2014’s Jack Walton (“small venues”) – but it’s relatively rare to get specific examples in the public domain. 4. Chaos or mind games? I’ve looked back on this phone call so many times over the years. Was this part of the cynicism of the show, manipulating me one last time, or did she genuinely forget? The producer Tabitha called me over for a chat off-camera. Now they began to work me. It was the same questioning as it had been all week and all series. The same, over and over again. And they weren’t even filming. What did this mean to me? How badly did I want it? Was this everything I had ever dreamed of? Well, right now I would trade it for a clean shirt and a plate of food. Three hours after he’d been expecting to eat dinner with his girlfriend, Steve continues, the ping of a microwave finally heralded the appearance of food – but he was told not to eat it, so they could film him and Simon with full plates. ‘What does this mean to you, Steve?’ [Cowell] said… I looked down at the M&S take-away going cold in front of me. Brookstein ends up bursting into tears, thereby providing great footage for his VT as Cowell sympathetically ushers him outside and gestures to the crew to stop filming. …more hanging around than singing. At auditions this was just part of the practicality of so many people wanting to be seen; at boot camp there was more to it. We were regularly in position when judges weren’t. Often we were sitting around in anticipation but doing nothing. With the central heating cranked up to the max in the summer, the silence of inactivity in a stifling environment created a tension that could only lead to TV gold. It’s easy with hindsight to say that so much of these shows are about the footage and not the performance, but you do not think that when most are waiting on their one shot at fame. You can’t see that the silence works for the edit, or that the heat and lack of food and water are a device to exude pressure. 5. How much innocence has been lost in eleven years? By now, anyone contemplating going on the X Factor knows – or really should know – what the deal is. You sign away all control over how you’re packaged and marketed; in return, you may or may not be granted some prime time television exposure. If you’re lucky and savvy, you may be able to use that exposure to improve your career, whether that’s in reality shows, musical theatre, or just playing your music in slightly bigger venues than before. Chart success is just as possible from finishing second (JLS, Olly Murs), third (One Direction) or even sixth (Ella Henderson) as it is from winning. This is so self-evident now, it’s easy to forget the relative innocence of 2004. Steve recalls in the book how then-presenter Kate Thornton would repeatedly say that the show’s winner would get a “million-pound recording contract”, while the others get nothing. It’s easy to sympathise with Steve for not having realised at the time the nature of the game he was playing. While much has changed about the show in those eleven years, some things remain the same. Being willing to do whatever is asked of you is no guarantee of favourable treatment – a theme that links the above Cassie Compton anecdote with Cory Spedding’s account of her audition this year – but it’s evidently a prerequisite to put yourself in with a chance of favourable treatment, not only during the show but after you win it. With luck, Steve’s book should help to open the eyes of future potential auditionees about what they’re letting themselves in for. Brilliant review of a very insightful book. Steve’s book shows how the manipulation goes far beyond the parameters of the tv shows, with contestants being dropped from interviews & media slots post show, thus impacting on their ability to sustain a successful long-term career. This seems to be a mantra that has been repeated into history. and I’ll add Little Mix – Syco. This to me is the real pattern of who has chart success, because chart success is inexorably linked to mass media coverage, and that only seems to being part of the Syco stable. Little Mix were winners and JLS signed with Epic. Olly also had a joint deal with Syco/Epic. Epic Records is a subsidiary or Sony ie Sony/Syco. The CEO & Chairman is L.A. Reid…who just happens to have been a judge & close friend of Simon Cowell. Which is why we’ve always had promo/mass brainwashing of the public into buying into these acts via Cowell shows. This site, together with Brookstein, Spedding and others, is kinda doing a public service in shining a light on how the show actually works and its complete contempt for its own “talent” and for the audience. I downloaded Brookstein’s book when he had it on offer but haven’t read it yet, and I read Cory Spedding’s recent FB post with dismay but didn’t realise she was the (excellent) Cumbrian girl who came second for us at JESC with her self-composed piano ballad back in the day. I know it’s prerecorded, but I’d like to highlight Bake-Off as a back-to-basics reality show that’s getting through-the-ceiling ratings of 9- to 12-million people (after a v low-key start on BBC2) precisely because it dispenses with all the manipulations and gimmicks people hate about reality TV – no “chosen ones” the show tries to steer to success, no 20-second pauses before announcing who’s been eliminated and who’s Star Baker, no nastiness between competitors or judges and competitors, no endless padding, no contestant sabotage or manipulative VTs, and thus no format fatigue… I would call it an anti-reality reality show, but actually it’s TXF and its ilk that are anti-reality. They could learn a lot from it. Now excuse me while I finish this Sachertorte. Got this book for xmas last year from a family member who knows about my keen following of the show. I had read it by the end of the year. A thoroughly good read. And none of it came as a surprise. Lent it to my mum who said to me that everything i had been telling her over the years was confirmed by what she had read in the book. The whole thing with Cory. Call me a cynic, but is the suggestion being made that the producers fast-tracked her through to the arena audition after being scouted through her previous association with Rita Ora? Just so they could then say no to her? I don’t buy it. If they’d gone to this trouble, it would have been to push through someone as far as they could, not to provide 5 minutes of TV at the audition stage that no one will remember anyway. Also – this story was published in the Daily Star. Are we not told by Mr Brookstein that pretty much anything related to the show that is printed by the tabloids is done so with their approval? I don’t know. It doesn’t ring true. I’m fully aware of how set up the show is, but how do we know it wasn’t just that she wasn’t as good as they thought, or that she had a bad attitude or something. The Cory story was less about her and more about building Rita Ora’s role as some super-judge who every girl wants to be (even her old school friends) & every guy wants to be with. They’ve done this in the past with Kelly Rowland, Tulisa and Nicole. This year, we’ve already seen the Olly Murs obsessed doppelganger audition which was obviously contrived. Given that they screened this, the Cory story becomes believable. The media can be split between those who work with Cowell/ Clifford & those who don’t. The Star have consistently leaked the correct information about results, placings etc. They have also run interviews with past contestants who have gone independent and are not linked to Cowell. I tend to trust what they say about TXF. The Mirror, in the past have seemingly worked with Cowell/Clifford. However, they may have turned recently, being very vitriolic about the current series and posting stories such as this one. The Sun & The Mail are bastions of Cowell propaganda. Pushing the same threads which appear in the show, telling the public who to vote for, drip feeding hate about the contestants the show wants to dump etc. Its not that you’re a cynic Phil it’s that you’re not cynical enough. It wouldn’t have taken a great deal of effort to contact someone and fast-track them through to the arena auditions. Well worth the effort for 5 minutes of TV when you’ve got however many episodes of auditions to fill. It is ITV’s flagship Saturday night program for a third of the year. It’s way too important to leave anything to chance when with a tiny bit of organisation you can write the storylines in advance and ensure you’ve got some drama. This is an excellent review. How is it that sofabet, a humble betting advice site, should be the repository of such well written articles and commentary? The articles and comments boards of the broadsheets are now indistinguishable from the Sun and Star, whereas this site boasts some exceptionally good writing. Good on you Daniel and regular posters like eurovicious. Even when I don’t agree with the opinions, they are always enjoyable to read. It’s good by the way to have yet more proof of Simon Cowell’s cold dead hand on the tiller. Like EV I prefer the simpler reality shows. But not for betting on. I’m at the point that I can hardly bear to watch the show anymore, even for speculative or analytical reasons. The thing that annoys me most are the constant close ups on judges during the (tiny amount of) singing. Their stupid, arch, contrived “this is what you should be feeling” facial expressions have actually started to make me feel angry, as well as patronised. I want to see and hear the singer. I want to come to my own conclusion and see and hear the judges opinion when the performance is over. There are more close shots of the judges than of the performers. The performers tend to get long and mid shots. There are other things I dislike, of course, but that’s the thing that’s really pushed me over the edge. The show has always been more about the judges than the performers but for some reason this year it’s really making me cross, much more so than usual. I just can’t bear to look at it. Anyway, rant over. I hardly watched the Saturday show and I’ve given up on Sunday already. Watching it makes me feel dirty. I may drop in to the site from time to time or maybe take more interest in the later stages but for now, like Mr Ballantyne, ah’m oot. It’s strange because, I think for the uninitiated viewer who doesn’t read up on how the show works, this year has come across as more open in terms of the manipulation and fakery (First Kings getting a VT, dancers on stage, people being called out for being on The X Factor Italy, America’s Got Talent, Britain’s Got Talent etc.) than previously. I think, because we read more into it, we spot the signs that the audience isn’t meant to see and maybe it’s a case of being very open with the major manipulation so the subtle manipulation goes unnoticed? A bit of a stab in the dark, I admit! I havent watched the audition or boot camp stages for years. They are ridiculously contrived like you say, treating the audience like idiots spoon-feeding them emotions and telling us how we should be feeling. The painfully unfunny bad auditions got old years ago. The clapping seal audience members and their standing ovations make me nauseous. Once we get to the lives though I love the manipulation probably because it becomes a battle of wits between the producers and the voting public and they cant have things all their own way. Really hope you stick with it as you are one of my favourite contributors to the site. The thing is that I’m actually a fan. That’s how I found sofabet in the first place and that’s why I’m so frustrated. If things carry on as they are Mr Hamby will make me choose between watching on my own or having a big thigh to grab hold of. That is not a sacrifice I am willing to make. None of it surprises me. The mercenary side of me though says good – let’s make some bloody money from it this year.